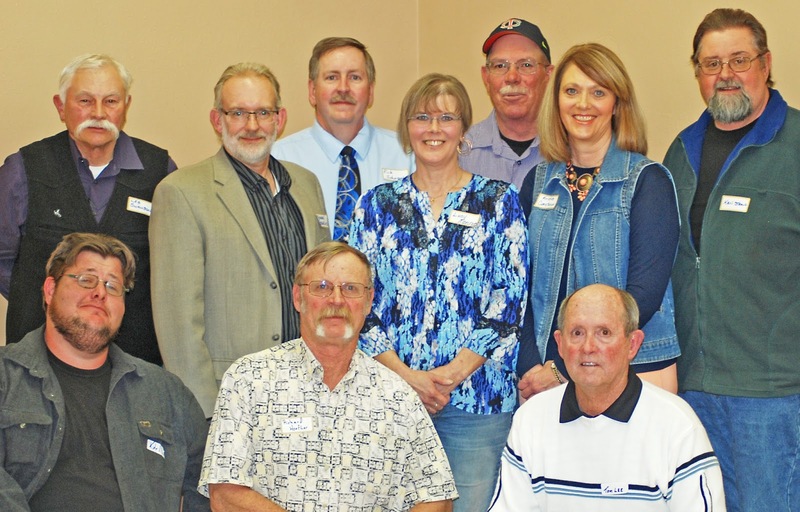 The community had the opportunity to question Hugo’s mayoral and trustee candidates during the “Meet the Candidates Night” held at The Depot on Monday, March 21. All seven trustee candidates, plus the three candidates for mayor, participated in the 90-minute question-and-answer forum hosted by the Hugo Improvement Partnership (HIP). Judy Vick was the moderator for the event. About 30 residents attended and submitted questions to the candidates. The purpose of Monday’s community forum was to inform the voters about the candidates prior to the April 5 municipal election. A new mayor and four of the six members of the Board of Trustees will be elected that day. HUGO’S CANDIDATES – Tcn candidates participated in the “Meet the Candidates Night” community forum Monday evening at the Depot. 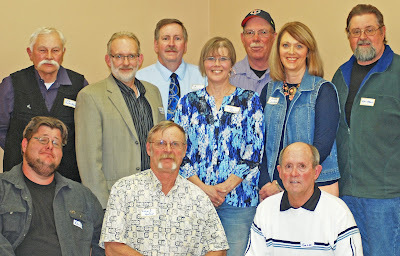 The seven trustee candidates (top row, l-r) are Les Swanson, Michael Gaskins, Richard Johnson, Lucy Monroe, Sam Emmerling, Kristie Constrance and Ken Stroud. The three mayoral candidates (bottom row, l-r) are: Kyle Lay, Richard Hoefler and Tom Lee. At the start of Monday’s forum, the candidates were asked to briefly explain who they are and why they are running. Incumbent trustee candidates Ken Stroud and Sam Emmerling both cited their years of service with the board and their desire to ensure a number of town projects currently in the works are properly completed. Stroud talked about his desire to “see things through” on a number of current town projects such as water and sewer. He also said it is important to work to expand the town’s business base, but do it in a way that protects the current businesses. Trustee candidate Les Swanson said his 30 years of military experience would benefit the town in making decisions to “get the town on the right track.” He talked about the need to attract new businesses or industry to the community. “If it’s here, people will come and stay,” he said. Richard Johnson, a trustee candidate, spoke about his years of experience in the military, as well as his service as a Sheriff’s deputy, paramedic and Public Health official. “The town does a great job, but there is room for improvement,” he said. One of his goals is to find ways to attract new businesses to Hugo which would encourage young families to stay. Trustee candidate Kristie Constance, a K.C. Electric employee, said she wants “progress forward” because “doing the same thing in town government would only get the same results.” Whatever the town decides to do should be “done thoughtfully” because bringing in a large industry is not practical “if we don’t have the infrastructure to support it,” she said. Michael Gaskins, the IT director at Lincoln Community Hospital, said he is a trustee candidate because “Hugo is home and I care about my home.” He plans to work with the “progressive organizations in town to come up with ideas” to improve the community. The three candidates for the Hugo mayor’s position also voiced their reasons for running. Richard Hoefler, a write-in mayoral candidate, is a retired Colorado Department of Transportation employee with 30 years of experience. He said his major focus as mayor would be improving the town’s water and sewer systems. Kyle Lynn Lay, a write-in candidate for mayor, said his goals include helping the town’s senior citizens as well as attracting “new blood” to the community. “We need to find new things to bind people to the town,” he said. During the question phase of Monday’s forum, the candidates were asked what could be done about the abandoned/dilapidated buildings in town that threaten the property values of other residents. Emmerling said the town board already has a dangerous building ordinance where old, dilapidated structures can be handled on a “case by case basis.” The board also amended the town’s weed ordinance last year to expedite the cleaning up of properties. Moving onto other questions, the candidates were asked how they would promote the town to prospective businesses and residents that are considering a move to Hugo. Monroe said she would tell them about her personal experiences as a cancer survivor and how greatly the community had supported her. “It’s the best community,” she said. “Hugo has heart,” Gaskins said. He explained the strong sense of community would be a major attraction to any new resident. Emmerling said one of the things he would do is inform prospective businesses and residents that Hugo’s water and sewer rates as well as its tap fees are among the lowest in the state. Lee said that as mayor, he would personally show prospective residents and businesses around town to let them know what a good community it is. As an incumbent candidate, Stroud was asked what he had accomplished. He replied that as a trustee he had helped oversee the transition of the town’s government to a committee system after being under a town manager for 34 years. “That was a big step,” he said. The most controversial statement of the forum was made by Lay who suggested the Town of Hugo possibly consider lifting its moratorium on the commercial growing and retail sale of marijuana. He explained it could be an important new revenue source for the Town of Hugo as it has been for some other municipalities in Colorado. Lee and Hoefler, the two other mayoral candidates, expressed strong opposition to lifting the moratorium on commercial marijuana production and sales. Some of the trustee candidates also objected to any change in the current status.